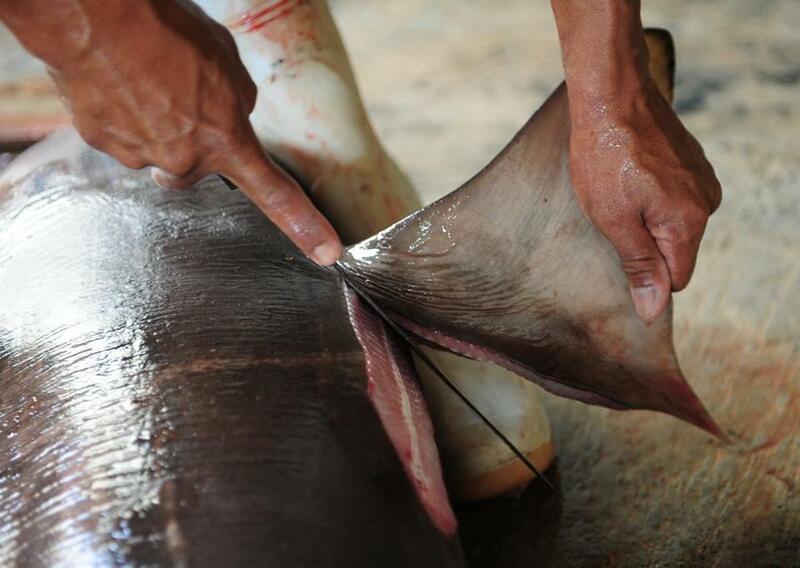 A worker cuts off a shark fin in Banyuwangi, Indonesia. Massachusetts today became the ninth state to criminalize the trade in shark fins, as Governor Deval Patrick signed into law new restrictions on the lucrative commodity that when served as soup can fetch more than $100 per bowl. The effect of the new law will largely be felt by companies that sell imported shark fins. The state and federal governments already ban their removal, which animal activists say generally happens when sharks are alive. In announcing his approval of the bill, Patrick’s office emphasized that the law would not have much of an effect on Massachusetts fishing. It exempts locally caught species including skate, smooth hound sharks and spiny dogfish. Supporters argue that such restrictions will help shrink the US market for shark fins collected in countries with weaker laws. Shark fin, generally served in soup, is a delicacy in East Asia. Poachers hunt any of the more than 400 sharks species that roam the ocean, which means that some endangered fish can end up in restaurants here, Laura Hagen, deputy director of advocacy for MSPCA-Angell said this week. Violators of the new Massachusetts law could face fines as high as $1,000, up to 60 days in prison and the loss of their fishing licenses, according to Patrick’s office. “With the passing of this law Massachusetts builds upon its long history of animal protection and environmental stewardship,” the governor said in a statement.